Trees and stones have long been objects of deep devotion in Japan. Originally there were no shrine buildings; instead a tree, forest, or a large boulder or a mountain, festooned with ropes, would be the focus of worship. In Japan the mysterious forces of nature, called ke, were believed to permeate palpable matter and formless space (collectively called mono in Japanese) to create mononoke. Mononoke was seen to coalesce in trees and stones. Certain trees, especially the cryptomeria and the evergreen sakaki, were considered sacred for this reason. When one of these trees was felled and the wood used in the construction of a shrine, this sacred quality was believed to follow it into the building. The sacred tree itself was literally and symbolically present in the form of a pillar or post around which the shrine was constructed. The great Shinto shrine at Ise is built amid a dense forest of giant cryptomeria trees next to the Isuzu River at the foot of Mount Kamiji and Mount Shimaji in the Mie Prefecture [see Mie Prefecture] in southern Honshu, Japan. Crossing the Uji Bridge and passing through the large torii gate marking the entrance to the shrine, a long path leads to Ise Jingu (Ise Grand Shrine). The shrine consists of two groups of buildings: the Imperial Shrine (Kotai Jingu), also known as the Naiku (inner shrine), and the Toyouke Shrine (Toyouke Daijingu ) which constitutes the Geku or outer shrine. The Naiku is dedicated to the Sun Goddess Amaterasu Omikami (Heaven-Illuminating Great Deity), and the Geku to the Goddess of Cereals Toyouke Omikami (Abundant Food Great Deity). Each shrine is composed of a number of buildings, including ancillary shrines, workshops, storehouses, etc. Each shrine has an inner precinct with a main sanctuary and two attendant shrines, as well as treasuries, fences, and gates. 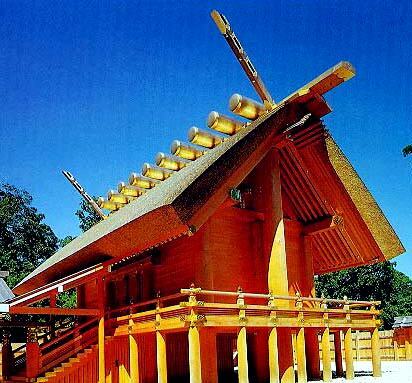 Both shrines are constructed of wood, and every twenty years both are totally rebuilt on an adjoining site. The empty site of the previous shrine (called the kodenchi) is strewn with large white pebbles. The only building on the empty site, which retains its sacredness for the intervening twenty years, is a small wooden shed or hut (oi-ya) inside of which is a post about seven feet high known as shin-no-mihashira (literally the august column of the heart, or more freely translated as sacred central post). The new shrine will be erected over and around this post which are the holiest and most mysterious objects in the Ise Shrine. They remain hidden at all times. 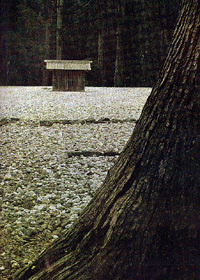 the erection of a single post in the center of a sacred area strewn with stones represents the form taken by Japanese places of worship in very ancient times; the shin-no-mihashira would thus be the survival of a symbolism from a very pimitive symbolism to the present day. The present buildings reproduce the temple first ceremoniously rebuilt in 692 CE by Empress Jito. The first temple had been built by her husband Emperor Temmu (678-686), the first Mikado to rule over a united Japan. Emperor Temmu had established Ise as the principal cult shrine of Imperial Japan, but the site itself, and the cryptomeria trees that grew on it, were already sacred before then. The cryptomeria is a tree associated with Shinto shrines. The principal sacred plant of Shinto, however, is the sakaki (a shrub related to the tea bush). The shin-no-mihashira is taken to represent a branch of the sakaki stuck upright in the ground. The chambers of the shrines are raised on timber piles which themselves are analogous to the central sacred post. The roof is not supported by the walls (although the rafters do rest on purlins), but the ridge beam is carried instead by two large columns at either end which embedded directly into the ground without any foundation. Besides trees, at the Ise Shrine are many subsidiary shrines of rocks from the sea which are regarded as the abodes (iwakura or rock abodes) of deities. Kenzo Tange and Noboru Kawazoe, Ise: Prototype of Japanese Architecture, Cambridge, Massachusetts: M.I.T. Press, 1965. Yasutada Watanabe, Shinto Art: Ise and Izumo Shrines, New York: Weatherhill, 1974 (first published in Japanese, 1964). The Roots of Japanese Architecture, a photographic quest by Yukio Futagawa, with text and commentary by Teiji Itoh, New York: Harper & Row, 1963 (first published in Japanese, 1962).